Full Moon Over Blue Ridge Cabin and two tree houses. Looking for a unique experience? Check out this cabin with two tree houses! Full Moon over Blue Ridge offers a little uniquness to your vacation experience. With the spacous covered deck for outdoor dining and the two tree houses, you will not want to leave. This property is located in the very popular Aska Adventure Area, yet not too far out. Full Moon over Blue Ridge boasts 4 bedrooms and 4 bathrooms. This is a perfect home base for a group looking for adventure. Tubing, hiking, and biking are a stone's throw away! 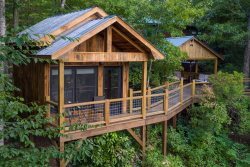 Location: Full Moon Over Blue Ridge is perfectly located to all the activities and amenities that make the Blue Ridge Mountains and the Aska Adventure Area so desirable, yet also secluded enough to relax and enjoy the quiet and natural beauty of the Chattahoochee Forest. Thank You so much for giving us a space to spend some much needed quality time in an amazing atmosphere and environment. The pavilion was the perfect place to come together. Amazing views and so much to do at the actual cabin itself, there really is no need to venture out much. Everything is easy to find and the cabin lets everyone kind of stretch out in their own spaces then come together in the common areas. Great place to stay!! My guest and I very much enjoyed our stay at your cabin. Everything about the cabin was amazing. The space was beautiful, the cabin had nice decor and style. From the view, the Jacuzzi, the ambience. I would 100% recommend this cabin. We would love to come back in the future.